I hope everyone is well, once again apologies for the lack of posts, i'm currently still in revision land, my final exam is next wednesday so almost over! Anyway I thought i'd do a quick review today because i've been using this product a fair amount over the past few weeks and i've remembered why I love it so much. 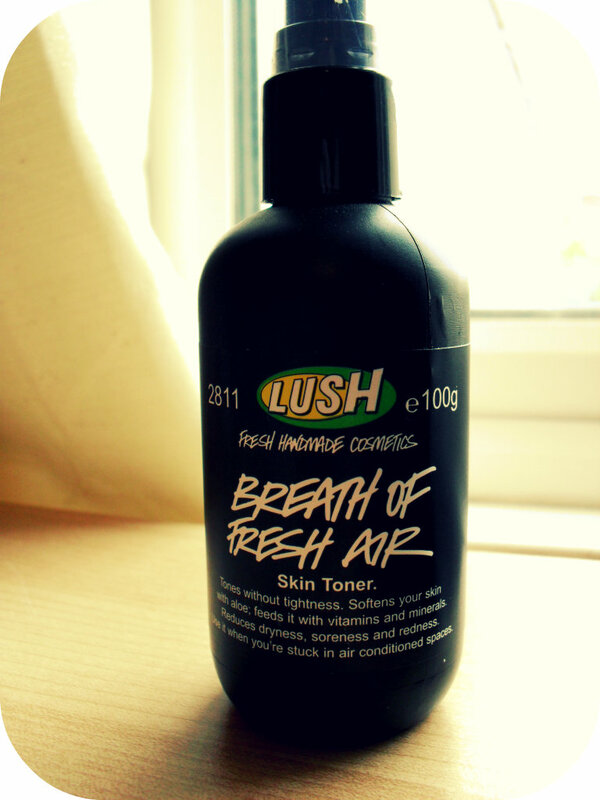 So it is Lush's Breath of Fresh Air skin toner. So standard Lush packaging, just plain black with a spray nozzle on top, which makes it really easy to use. I have the 100g bottle which retails for £3.75 but they do have a 250g bottle which is £7 depending on how often you'll be using the product. I've had mine for a while now and its still pretty full as you don't need a lot of this. Lush state that this is a toner to soften your skin with vitamins and minerals and that it reduces dryness, soreness and redness. It has seaweed, aloe gel and essential oils and is scented lightly which is good because i'm not a massive fan of heavily scented products for the face. To me the strongest smell is rose water but its very light and not overpowering. On to whether it works, the simplest answer is yes! I adore this product, I use it whenever i've been in a stuffy environment, think aeroplanes, offices, uni buildings, anywhere where the air is stale or there is a lot of air conditioning. It always makes my skin feel horrible after being in those types of places, because it drys out your skin and air conditioning is notorious for spreading horrible germs and just generally making you feel a bit grim. So I use this to refresh my skin and it really does work, it makes my skin really soft without making it feel tight, it has definitely helped any dry patches i've had particularly on my forehead. It makes your skin feel fresh after a long day and also the scent is quite relaxing so I find it quite calming if you've had a busy day or its been a bit stressful. You can also use this on the body as well which I think is great for hot summer days, it would definitely cool you down. I also use it to remove any traces of cleanser before bed and its great for that too. All in all a great product and one i'd definitely recommend if you work in an office or travel a lot! Not is one Brand for me...allways the product not response the publicty. I hope you have more luck that me. Awesome review! Found you on hellofrances.blogspot.com. :) Stop by and follow back at http://sassyshopperreviews.blogspot.com/ when you have time!